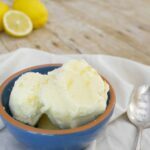 This tangy low carb lemon ice cream is the perfect dessert for the summer! Creamy, zesty, sweet and tangy – this ice cream is SO good! It is perfect for a hot summer’s day, although it is so refreshing that you can enjoy it at any time of year! 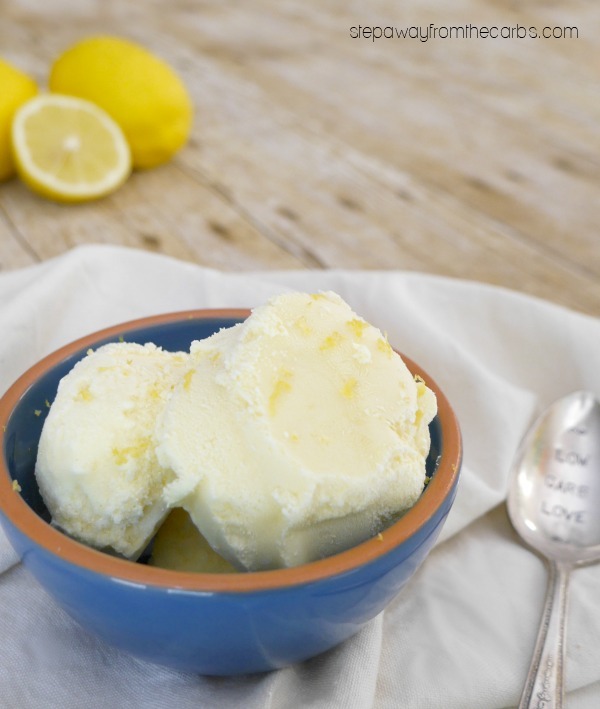 To make the ice cream base, grate the zest of a lemon, then cut it in half and squeeze out the juice. 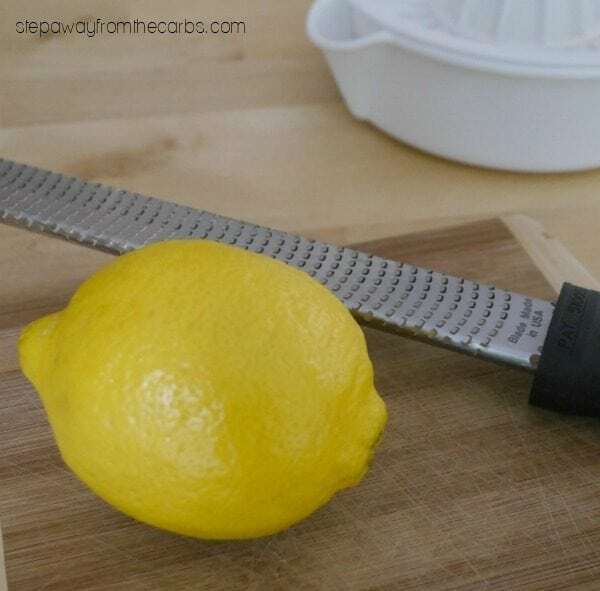 I use a Microplane Zester – it is really easy to grate the zest of lemons or limes! Add the zest and juice to a food processor along with room temperature cream cheese, unsweetened almond milk and Da Vinci liquid sweetener. Blend until smooth. Do a quick taste test for sweetness – you may prefer it a little sweeter, if so you can add more of the syrup, then blend again. You could also add a couple of drops (no more!) of yellow food coloring if you want to give it an extra lemony look! 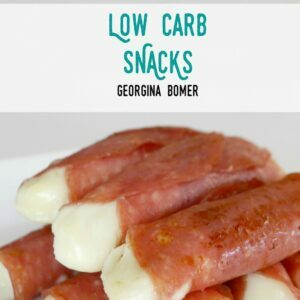 Pour it into a bowl and leave in the fridge for an hour. 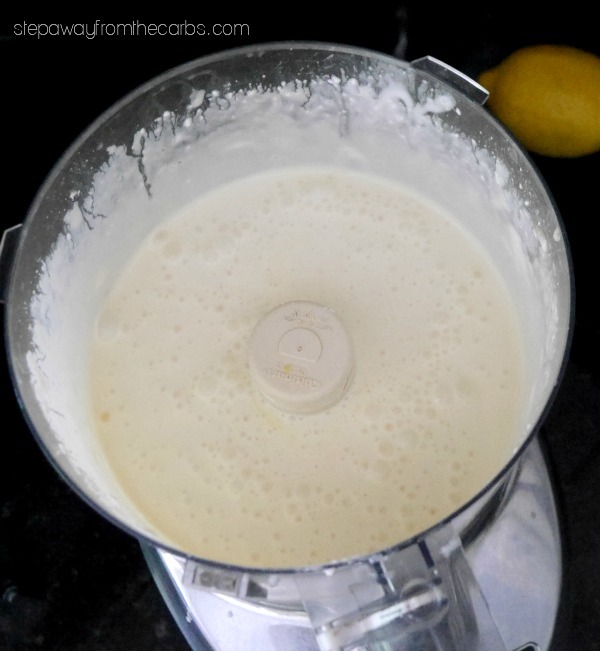 Then pour the mixture into an ice cream maker – I love my Cuisinart! Once the ice cream has churned, transfer it to a container and freeze. Sprinkle with extra lemon zest if desired. Add all ingredients to a food processor. Start with just ¼ cup of the sugar free syrup. Blend until mixed well. Test for sweetness, add more syrup if required and blend again. Add food coloring (if using), and blend for the final time. Transfer to a bowl and chill in the fridge for an hour. Transfer to an ice cream maker and follow the manufacturer's instructions. Place in the freezer. To serve, sprinkle the extra lemon zest over the ice cream, if desired. I love the recipe, however erythritol or monk fruit would be a better substitute, as Splenda is an artificial sweetener and many people are allergic to it. The closer to real food that we can get, the better. Oh that’s really strange – thanks for spotting that! I have now corrected it. I have a Xylitol Sweetener Syrup. Do you think that would work in place of the Da Vinci’s? Thank you. Ooooh I’ve never tried that! Does it have a brand name? I can’t see why you couldn’t use it though, but I’m not certain whether you’d need the same quantity without knowing how sweet it was. 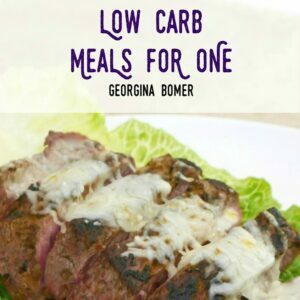 I would suggest adding it in last and adjusting to your personal taste.